The original recipe called for pressure-cooking bone-in chicken thighs to get both enriched broth and meat. I always have gallons of my homemade crock-pot stock on hand, and had just made a fresh batch the night before, after carving up a chicken carcass to use the breasts for orange chicken; the thighs and drumsticks still needed using up, and were perfect in this soup. Ladling about a quart of stock into my soup pot, I added the coconut milk, curry powder, garlic, some dried lemongrass, raw sugar, fish sauce, chili flakes, and strips of dried ginger and lemon zest. The chicken parts poached gently in this aromatic liquid until they were cooked through and shreddable, and then went right back in with a handful of baby spinach, some chives, and a squirt of lime juice to finish it off. To make the soup a more filling meal, I served it up with a scoop of handily leftover rice, and it worked wonders on my stuffy nose. Nolan stuck with plain chicken and rice, lightly drizzled with broth. Combine ingredients from broth to crushed red pepper and bring to a simmer over medium low heat; add chicken and cook about 20 minutes, until cooked through and tender. Transfer chicken to work surface; cool briefly (fish out the lemon zest and ginger strips here, if using). Remove bones and cut or shred chicken into bite-sized pieces. Return chicken to soup; add spinach. Simmer until spinach wilts, about 1 minute. Add lime juice and scallions or chives. Taste and adjust seasonings as necessary. Press a serving of rice into a cup or ramekin and upend into a shallow bowl, and ladle soup around it. Serve with lime wedges and cilantro if you go for those sorts of shenanigans, and be sure to breathe in deeply through your nose! 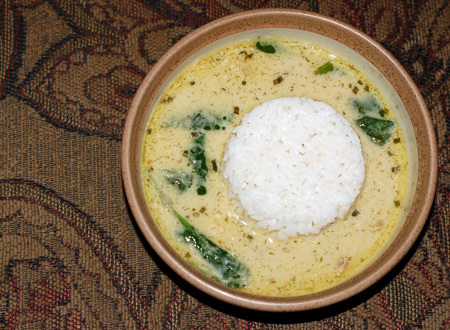 We always like curry and coconut curry soup. Just right for a cold. Yum!